I’m the pill popper in our office. Don’t worry, it’s not like I’m on all sorts of medications. I take vitamins and supplements to stave off Allergy and Cold Season. What’s the difference between allergy and cold symptoms? Fall allergy triggers typically include different weed pollens. Damp leaves that start to get moldy also trigger mold allergies. That’s why my so many folks rake their yard each fall, except those of us in California desert where we don’t have leaves that fall or much yard for that matter. A Neti Pot can also cut down on allergies, if you’ve never heard of one, check them out here. It’s an old Hindu device used to wash the sinuses and works great but be sure to follow the directions and use only distilled water and the proper salt additive designed for its use. The drop in temperature this time of year is the perfect temp for viruses to attack. There are about 200 different viruses that cause colds, however, the majority of us get sick from just the one called rhinovirus (aka, the common cold). No, it has nothing to do with Rhino’s. According to a study published in Proceedings of the National Academy of Sciences of the United States of America, the chilly air weakens your body’s defenses. So, the lower the outdoor temps, the weaker our bodies’ response is a virus. Which means we are less able to resist the rhinovirus. My mother was a health nut in the 70’s before it was the in thing. She’d tell me that the only two supplements to help with a cold are zinc and vitamin C but you need to pound them when you first feel a cold starting. Here’s why: Supposedly, Zinc strengthens the body’s “T-cells,” which fight off invading bacteria and viruses in the body. 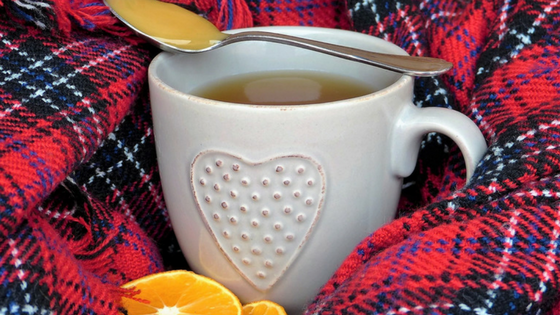 Vitamin C, an antioxidant, can reduce symptoms of a common cold within hours if the dose is high (I take 1,000 mg daily but 5000 mg of a powder for rapid absorption per day for 2 – 3 days when I feel a cold coming on or a tickle in my throat). This is meants to help combat inflammation and regulate blood flow. Of course you can get vitamin C through proper diet like citrus fruits (oranges, grapefruit, etc), green, red, & yellow peppers, and broccoli, but not in the amount you need to fight off a cold. When my son had a sore throat last winter he was miserable. I tried to get him to take 3,000 mg of Vitamin C but that’s a tough one for a teenager. His cough got so bad he couldn’t sleep and I was so desperate that I tried several different cough remedies and formulas and was the only thing that helped him sleep through the night. Vitamin C also helps your body absorb iron, which is needed to carry oxygen via red blood cells through your body. This is the center element in the hemoglobin molecule. Studies found in the Cochrane Library [link to: https://www.ncbi.nlm.nih.gov/pubmed/10796569], one of the most prestigious database systems, evaluated many trials involving vitamin C and the common cold. They found taking higher doses of vitamin C cut the duration and severity of common cold symptoms. Other tips can include getting exercise, washing your hands more frequently, and don’t share drinks, or utensils and don’t eat food or touch your eyes or mouth after touching things in public areas (door knobs, doors, counter tops, items when shopping, money, etc). is also a known supplement that helps reduce the duration of the cold virus. Obviously, If a cold turns into the flu or you don’t start feeling better 3 – 5 days out, please seek out your doctor. Antibiotics won’t help knock out a cold virus but if there’s something else going on, your doctor would know best. Boosting your immune system now can cut down on symptoms and complications should you get sick or suffer allergies.